If you caught Part I of this story then you already know the beauty and splendor that is Isla Isabel. If you didn’t, you need to check that out. (Click Here for Part I) And yes, the shore adventure was spectacular to say the least. The birds and iguanas combined with the beautiful views would have been enough for me to say this is a place no one should miss but then no trip to Isabel would be complete without some snorkeling or diving in her magnificent, clear blue waters. After our morning hike around the island we headed back to Dazzler to cool off and enjoy a cool, refreshing Pacifico or two. There’s nothing better than an ice cold beer after a hot and steamy trek through the jungle. We took a break, sat in the cockpit and enjoyed the views for a while. It was a wonderful day and we were the only ones in the anchorage. It was just us, the ocean and the wildlife. There’s something so special about being in an anchorage when there isn’t another soul in sight. I’ve said it before and I’ll say it again…it makes me feel like an ancient explorer. Well, let’s just leave my age out of this! Being able to see the all the fish from above was wonderful to be sure but we finally decided it was time to take a peek at the undersea world of Isabel. Suited up and ready to go we leaped into the water. WOW! That was really nice. First a few frosty cold ones to chill our insides and now a splash in the water to cool the outside. Yes, this was shaping up to be quite a wonderful day. 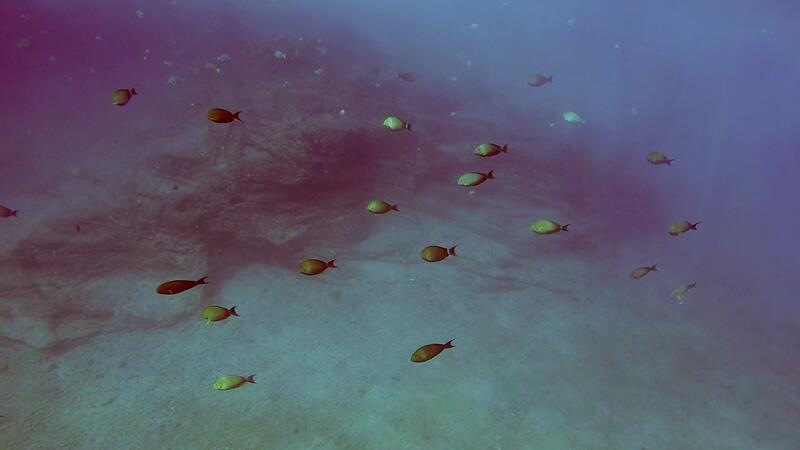 The water clarity made for some amazing snorkeling around the monoliths. We saw trumpet fish, sergeant majors, parrot fish, a turtle and a host of other colorful sea creatures. One thing I did notice, however, is we didn’t see even one ray. In the Sea of Cortez you could hardly get in the water without running into a few or even a few hundred of them. The further south we’ve come the less and less of them we see. Isabel is as beautiful and magical underwater as she is on land and I’m sure I could spend a lot of time telling you about how beautiful it was beneath the surface but then I’m not that good of a story teller so here’s some photos and a short video of our day here. After our snorkeling adventure we showered and prepared for a spectacular dinner. Captain Dan jumped in the galley and made crab stuffed mushrooms with a balsamic, shallot reduction sauce. Oh yeah! Yep, Isla Isabel will remain very near and dear to my heart! If you ever get a chance to see this place, do NOT pass it up! I promise you will not be disappointed. Make sure you follow us to receive emails when we update our blog. First let me begin by saying that some people call her Isla Isabel while others may refer to her as Isla Isabela. Isabela is what you might see on charts and plotters, however I have chosen to go with what the Mexican government calls her which is Isla Isabel. No matter what one chooses to call her, Isla Isabel is truly paradise on earth! Imagine sailing into a tropical anchorage. The water is so clear you can see the colorful fish as they perform their elegant and perfectly timed water ballet beneath your boat. The beach is white and the island itself is covered with lush, green, tropical foliage. Large waves slap the rocks that line a portion of the shore and with each slap they burst into peaks of white foam leaping into the air as if to say, “Look at me!” Soaring above the island in the sapphire blue sky are literally thousands and thousands of birds riding the air currents and swooping down into the trees searching for a suitable place to call home. The intense cackling of the birds can be heard clearly as you lower your anchor and prepare for your stay in utopia! Yes, Isla Isabel is truly a sight to behold and one that should not be missed if you can help it. Isabel is a volcanic island located approximately 15 miles from the west coast of mainland Mexico and 90 miles south of Mazatlán. The island is a little less than a half a mile wide and three quarters of a mile long and was deemed a National Park on December 8th, 1980. It’s often been said it was one Jacques Cousteau’s favorite places and that Cousteau himself actually made the recommendation to the Mexican government to designate this island as a National Park. He spent a great deal of time here and has aired many specials on this fabulous gem. One visit here is all it takes to understand his love for the island. And while the sea life and water are truly spectacular, the life on land was just as riveting. 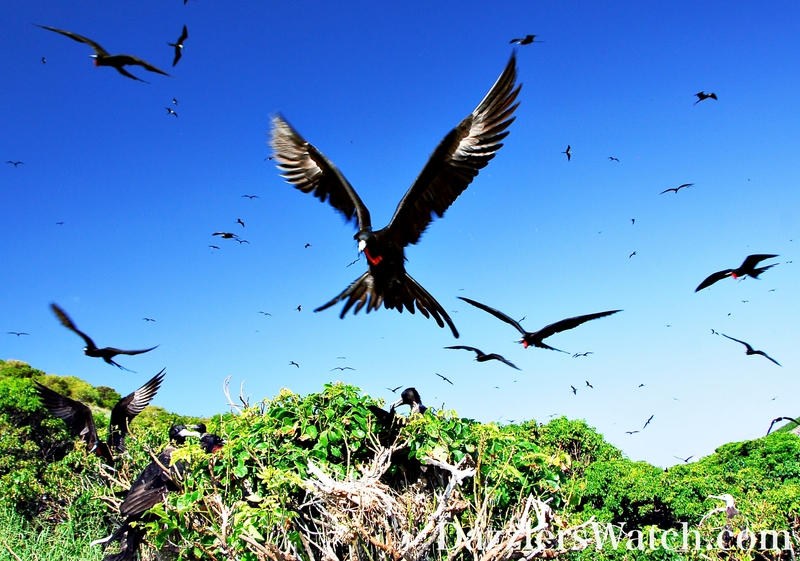 Isla Isabel is known for her extensive bird population including nine species of seabirds. I have never seen so many birds in one place. If you don’t like birds, I recommend you stay on your boat but if you do you will miss a truly exceptional adventure. We, on the other hand, love the wildlife and were excited to take a trip on shore to experience it up close and personal. You can anchor your boat in the southern anchorage that is just east of the fishing village but you need to be cautious of the rocks. There are many. They are more like boulders than rocks and cruisers have been known to call them “anchor eaters”. We chose to anchor on the east side of the island near the monoliths and were glad we did because the swell hitting the southern anchorage was pretty big during our stay. The boats anchored there were really rockin’ and a rollin’. When we arrived at the island the Guardia del Parque (Park Guards) were there on their pangas to tell us where we could drop the hook. Apparently there are some coral beds on the east side of the island these days and they want to be sure the cruisers are not harming them. At first Dan wasn’t very happy about where we were told to drop the anchor as it was a bit close to the monoliths for our taste. When I say close, we were a little less than 300’ from the underwater shelf that surrounds them. As a rule we tend to anchor a bit further out so if weather comes in and we need to bug out we have a little extra room to maneuver but when in their waters you abide by their rules or you move on. That said we stayed where we were for three days and didn’t have any issues with the anchor dragging or getting caught on any rocks. Captain Dan does recommend that you put a float on your anchor line whether you are in the southern or eastern anchorage. This will help you to retrieve your anchor should it get caught in the anchor eaters. One day we took the dinghy ashore to explore the island. In the water as you approach the east end and of the fishing village you see these dome shaped objects just below the surface. They are underwater habitats for lobster and other small fish. Once you reach the shore you will see a dozen or so of these creations sitting on the beach. I’d never seen or heard of such a thing before. The Mexicans are not particularly known for their concern over the ecosystem so it’s nice to see this, even if it is just a small attempt to help preserve the sea life. We landed the dinghy on the beach at the fishing village which is a perfect spot to start exploring. On the southeast side of the village there is a peninsula where you can walk to the top of what I refer to as “Boobie Rock”. There were hundreds of brown-footed boobies nesting there. The cool thing about this place is that the wildlife literally has no fear of humans. You can get within a foot or two of these beautiful birds and their nests and they won’t even move. We tried to give them a little more space to help ensure they keep their friendly nature. On Boobie Rock we saw nests with eggs, newborn birds, juveniles and their parents. It was so awesome!